Before you read further, I would like to make the point that it not a cricket bat which performs, but the batsman using the bat is the one who actually performs. Having said that a good cricket bat will enhance the performance when it is in the hands of a capable batsman. I decided to play Mythbusters and on a nice sunny day, I picked three brand new bats from different manufacturers and took them to a park along with some family, employees and friends. I have all the bats in bat covers to protect them as the bats I choose for testing were quite expensive. All bats weighed around 2.7 to 2.9 lbs since the day was nice we decided to have BBQ in the park as well :) in case we get hungry after hitting the balls. The idea was to have fun and test my theory, we took some new Stealth cricket balls with us of same weight for testing purposes. The purpose was to have a controlled environment for the test as much as possible. Batsman was not wearing gloves or pads as the balls were thrown as full tosses at around knee height with friendly pace allowing batsman to hit freely. We took the following three bats with us for testing. Each individual bat was picked randomly from our available stock. Gunn & Moore have other bats which are of higher willow grade but we do not sell those bats, so we took what was available to us. 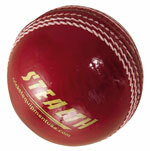 The following three cricket bats and stealth balls were used during testing. Here are the pictures of the equipment used in testing. According to Gunn & Moore 707 Willow graded bats have following characteristics. Hand selected premium reserved air-dried English willow. Graded as A grade English willow by Ihsan. 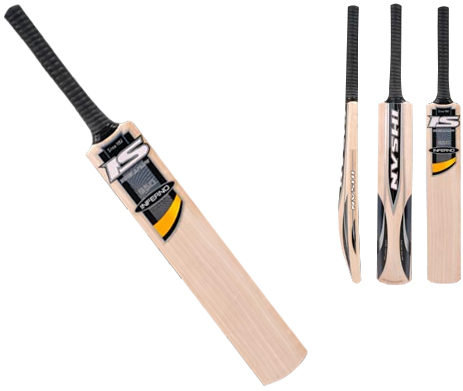 CE USA & MB Malik bat is graded as grade A, hand made naturally dried English willow. This is actually an MB Malik limited edition bat clean with straight grains with no blemishes or discoloration. The willow of this bat is selected and graded by MB Malik. The bat is treated with fiber glass protection at the toe of the bat. We were all set to start our testing process, we measured the distance from batting crease to the long on and long off boundaries which was about 145 meters and laid down some white sheets on the ground after 145 meters. I played some test shots by tossing the ball in the air and hitting on both sides of the boundaries make sure I can hit past 145 meters :) after few attempts I was able to hit the ball past boundary without a bouncing before the boundary line. In other words I was targeting to hit six, we applied some red color to the ball before tossing the ball so when it falls on the white sheet it will leave a mark for calculating the distance traveled by the ball. I picked up the Icon 707 and our famous bowler tossed up a juicy full toss which was smashed right over the bowler's head for a straight six falling about two meters outside the boundary so about 147 meters, the second ball over long on for another six just over the boundary about 146 meters. After playing those two shots I felt that both of them came from the middle of the bat right from the sweet spot. I felt that the angle of the shots was more than 45 degrees as from the projectile motion law the ball will travel the longest aerial distance if hit with same amount of force compared to other angles. It is kind of hard to figure out what angle I was hitting the ball but my total concentration was on hitting the ball as far as possible. The third ball on long off end up with the same distance. The fourth and fifth and sixth balls went straight over bowlers head reaching 145, 148 and 148.5 meters. So the stats looked something like this for the six ball over with Icon DXM 707. After the sixth ball I took a break had some Gatorade and picked up a charcoal flame grilled drumstick from BBQ grill and got ready to test the Revolution bat, the bat felt bit heavier at first but was a bit thicker in the middle as compared to Icon 707. The first hit over long on went for 150 meters, wow that was the longest boundary I ever hit yet, the ball did came out of the middle of the bat and I felt less vibration in my hands after the stroke. I dispatched other four balls to the boundaries all going over 150 meters and the last one went for 145 meters. I felt that I drove that ball from an inch above the toe of the bat. Ok, time for another break and more BBQ'ed chicken, maybe that BBQ chicken was giving me more energy to hit the ball further :) or it might be that the thick edged grade A Revolution bat has something to do with it. I believe it was later than the other. Some more Gatorade and I was ready to test the Inferno 950 which has played a part in getting so many runs for West Indian sensation Chris Gayle. I am sure I cannot hit the ball as far as Chris, but wanted to test it with whatever fire power I had. The first ball went for 149 meters, second for 151, third for 148, fourth for 147.5, 5th for 152 and last one for 146. So that concludes our very crude testing of high end cricket bats from three different brands. There were several balls which were mishits and were not counted in the test. It is quite hard to hit 18 full tosses in succession to the boundaries. I noticed a marginal difference in Ihsan and our CE bats. Also the GM bat used in testing was not their top of the line limited edition bat, so maybe because of that the traveled distance was not as close to Ihsan or CE limited edition bats, to be fair to GM it was not apple to apple comparison. However, this was just a test for fun and maybe this write up might help some researchers and young cricketers gain better understanding about the cricket bats.